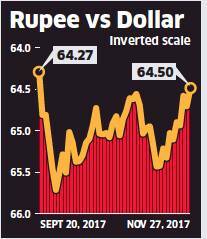 Showing resistance against early volatility, the rupee surged by a hefty 20 paise to end at a fresh two-month high of 64.50 even as S&P kept India’s credit rating unchanged. The rupee marked its best closing since September 20. The rupee has appreciated 31 paise last week.